**For those of you who are reading these I have placed a special notation at the beginning of certain testimonials. the reason is some of these clients or their horses where very dear to me and hold a special place in my heart. They have since passed on to bigger and better pastures and may God bless there souls, I will miss them and they are in my prayers.
" Jim - The Tooth Whisperer"
My Horses Love Jim! They are never stressed or Frightened when he's working on them. I feel better knowing my horses aren't being traumatized while there teeth are being floated. He does a more thorough and naturally balances them without the use of a speculum. ** I have waited to have the "Perfect Dentist" for my horses for over thirty years and now found such an individual in Jim Cormier. He is caring, intuitive and extremely knowledgeable. Jim Cormier has " The Touch" and may he continue in the field of equine dentistry for many many years to come. Jim, you were such an inspiration to my daughters and me. The day before you came I was upset and doubting my ability to own and handle horses. When you came to naturally take care of our horses we were so impressed with the way you calmed them. You renewed my spirit and my reasons for wanting horses. You brought back my love of horses from childhood and helped me to separate from all the "Professional" equine expectations. James came to our barn and was asked to float a mare, three weeks earlier this mare had injured her owner during another dentists attempt to do her teeth and the dentist had finally given up the mare just freaked out. James took her into the arena and with calmness, gentleness & patient persistence soothed her to the point where she was standing calmly and accepting the work. It was one of the most amazing pieces of horsemanship I have ever seen. Drugs aren't necessary when you are a true horse-person. My horse loves him! Growing up I was a "horsey-child", then nearly thirty years had past when I became the owner of 2 mares in their late 20's. I wanted to do the right things for them and one of those things was to hire a real "equine dentist", I did. With each visit I'd anticipate the improvements and wait to see it happen. Mild improvements happened and the "adjustment time" after floating took longer and longer with more discomfort and anxious discontent at meal time and in between visits. And then, " No Drugs, No Restraints, No Speculum" what did we have to lose? Jim has worked on my old Icelandic mares now for a little over 2 years. Perla is 31 and i wish my teeth were as good as hers! Lukka is 32 and what she has left in her mouth is a mess and problamatic to say the least. Jim has given her obvious relief and better comfort with what she has . I can admit that I don't know a lot BUT i know when I see huge improvements in her overall and since jim has come to help and this is just what i seen. Jim approaches his work with an unexplainable patience and gentleness of his skill that the horses relate and respond to. He is true to his words... No Restraints, Drugs or painful speculum. He floats with his hands (and is reaching those razor sharp teeth that are farthest in the back). He floats from his heart with a talented gift which clearly he was given. in today's bizarre world it is so refreshing to watch someone use their gifts in good ways. He is our blessing and i am so grateful to have him. The horses who have Jim working on them are indeed the really lucky ones and i am proud to be among the lucky group. My animals deserve the best of care - thats why their dentist is Jim Cormier. He has an open and inquiring mind with a thirst for knowledge which enables him to progressively explore alternate theories and will patiently explain to his customers the whys and there-fores of many subjects whether it be the anatomy of the horses mouth or the type of flies in your barn. 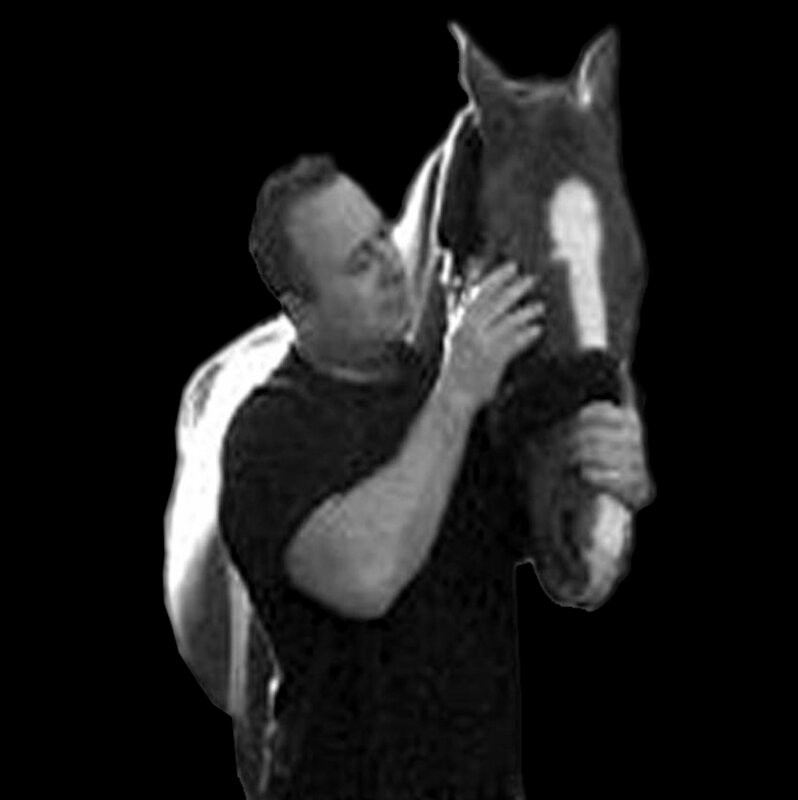 he uses the most gentle caring and accurate techniques with the foremost concern of the horses well being - as well as providing prompt and courteous service. My ponies Love him - when he's done they reach over the stall and ask for more! Amazing I'm in awe of his ability of keeping the horses calm while he did his work! My horses are in love with him! Absolutely No Mechanical Devices used. No extra help. Does ALL on his own. No chains, no mouth opening or keeping mouth open devices. gentle and understanding for each horse. takes each horse in its own right. Great attitude & professionalism all the way. I was very impressed with Jim, how he handled the horses without tranquilizers, chain shanks, or any force. the horses really seemed to enjoy having their teeth floated by Jim. I will never use anyone else but Jim to float my horses teeth from now on.